It was twenty five years before Steve Wiser realized his dream of becoming a professional jeweler. He grew up in the rolling hills of southeastern Washington State, crafting jewelry as a hobby. In 1996, he gave up a 15-year career in purchasing and moved to California to pursue his dream of making jewelry for a living. 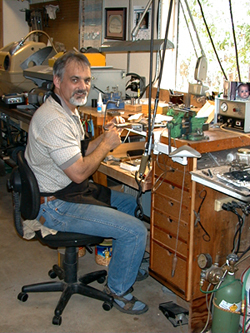 Although largely self-taught, over the past few years Steve obtained his Graduate Jeweler Certificate from the Revere Academy of Jewelry Arts in San Francisco. As his premier line of jewelry, Steve chose to develop recovery jewelry designed to allow any member of Narcotics Anonymous or Alcoholics Anonymous to subtly identify as being in recovery. Steve handcrafts all of this NA and AA recovery jewelry in his home studio. We trust that you will find something that fits your style and taste. Ideas for other pieces are welcome!